I almost always fail at meringues. They come out too chewy, cracked and crumbly, oddly shaped. I generally opt to make ‘shards’ of meringue that sit on top of nice looking desserts, that way I’m covered for all of the above. Either way they always taste good, and so I keep making them. For this blog post I called my Grandma and got her recipe, and tips, so here it goes. Preheat oven to 140 degrees. Grate fresh ginger and set aside. Keep 2 tbsp. for the meringue and 1 tbsp. (plus any ginger juice) aside for the cream. Blitz sugar in a food processor so it’s fine. I do this so the meringue doesn’t end up grainy. De-grease your mixer bowl with the lemon wedge and make sure the beaters are super clean. Mix egg whites with a pinch of salt and cream of tartar on a medium speed until they’re foamy. Turn the mixer to high and start adding sugar 1 tbsp. at a time and beat until mix is thick and glossy. When you think its done run some mix in between your fingers to check it’s not grainy. Place a piece of baking paper on a flat baking tray and trace around a cake tin (23cm) with pencil, onto the baking paper. Then spread the meringue mix evenly into the circle. I went to the trouble of tracing the circle then for no apparent reason ignored it and made an enormous flat oval shape. Oh well. Bake for 1.5 hours, or until the meringue comes easily off the baking paper and is hollow sounding when you tap the bottom. Leave to cool completely in the oven. When you’re ready to assemble, beat the cream until it reaches soft peaks and stir through mascarpone, ginger and icing sugar. This recipe is really ginger-y, and I like the little tiny flecks of fresh ginger that burn your mouth a little in the cream. However, if you don’t, just use the ginger juice and leave pulp out of the cream mix, it’s still gingery enough with the meringue. 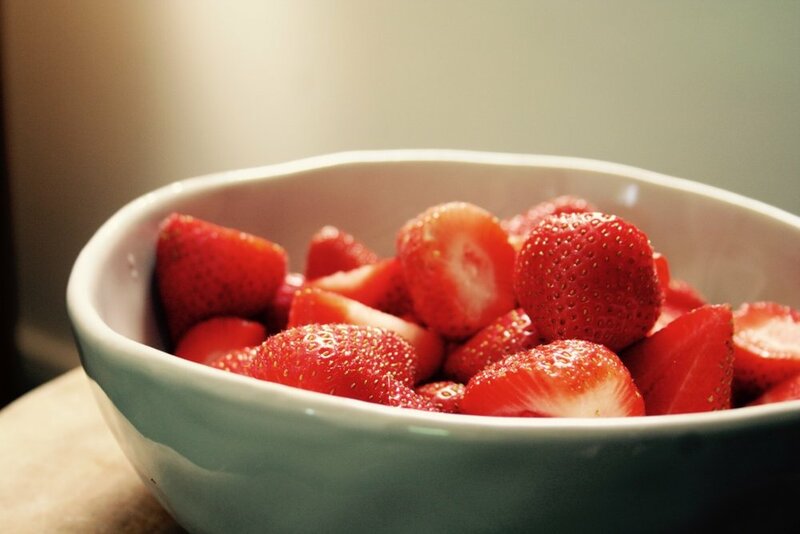 Cut larger strawberries in half and leave small ones whole. Smother all the mistakes in your meringue with the cream then pile on the strawberries. One benefit of making an enormous flat meringue was that it cut into pieces quite easily rather than turning into an Eton Mess in your bowl. And since it started to resemble a pizza, I went with that and cut 8 pizza triangles to serve.